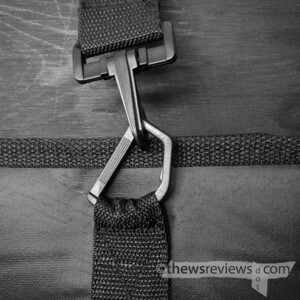 The Long Version: This is a review that probably could have been shortened down to under 140 characters, but I need to rant: WTF is with the D-Rings, bag designers? I bought a cheap portfolio case the other day, and sure enough, the shoulder strap is attached to the body of the case with nylon D-rings. Within minutes of actually using the thing, the D-rings are twisted sideways and pinching the nylon webbing. I've seen this over and over again, from bags that cost enough that this kind of foolishness shouldn't be tolerated. It's not like these things are a recent innovation – why do designers and manufacturers still insist on using them so badly? There is another question: why do people still buy anything that uses them? Frequently I forget that I'm supposed to be performing quality control on products that have made it all the way to market, and often there simply aren't any options out there. But give me a round ring to attach straps and handles, a sensible buckle, or even a D-ring that's been properly secured, and I'll buy it instead. Surely, this can't be all that difficult a problem to solve. Yeah, but: As if it matters what I think. 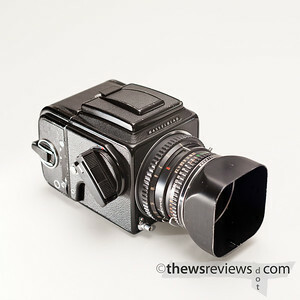 The Long Version: The Hasselblad 500 is a legend. Immediately recognized and viewed with respect even by non-photographers, it screams 'serious' in a way that few other cameras do. Manufactured for decades, there's a huge base of compatible equipment in use and on the resale market. Some of it is certainly showing its age – such as mine, a 500cm model bought in 'bargain' condition from KEH.com – but it's remarkably reliable and robust. It's too bad that it's such a pain to use. I don't mind the meter-less operation or the all-manual everything, but the clockwork camera is very temperamental. Any discussion online about the intention to buy a Hasselblad eventually degenerates into "it doesn't lock up that often…" and "…it's really easy to fix…". I needed to figure out how to reset both the camera and lens quite promptly with mine, making it the first camera in years that I've needed help to operate. 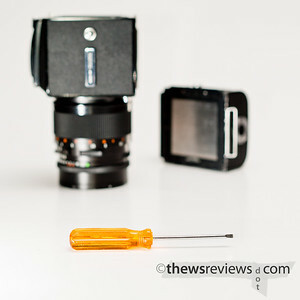 When I use my Hasselblad there's always a small screwdriver in my bag. I bought it – $1.95 at the local Home Hardware – specifically to use to reset the camera when it jams. (The only other thing that I routinely carry tools for is my bike, and I've never actually needed any.) And because the back needs to be removed before the camera can be reset I also need to carry the dark slide for the one and only film back that I own. These are thin metal that must not be bent, and naturally the `blad's backs don't have a built-in dark-slide holder. Film backs that have been modified with aftermarket holders sell for considerably more on the used market. Nifty. To reset the camera, remove the film back and set the camera lens-down on a table, or point it downwards on the tripod while on the Coney Island boardwalk on a cold and blustery day in March. Open the spring-loaded doors to be able to access the camera from behind the mirror, and find the small steel screw. A headlamp really helps here. Then all you need to do is use the little slot-head screwdriver to turn the screw against increasing tension until it clicks into place. This needs more rotation than is possible with a single twist of the wrist, so make sure that the screwdriver tip doesn't hit anything fragile or scratchable when it inevitably slips out of the slot. Repeat as needed. The procedure for re-cocking the lens is about the same, except that the mirror needs to be up and now the screwdriver tip is much closer to the rear element of the lens when it slips. So far I've only had to do this once, and have had to unjam the camera at least a half-dozen times, so I suppose that makes it a rare occurrence. One thing that Leica and Hasselblad share is the need to learn a new vocabulary. The term to know with the `blad is "bay", as in Bay 50 or Bay 60. This describes the size of the bayonet mount for special Hasselblad-compatible filters, because the lenses don't have the filter threads that almost every other lens for every other system on the market will have. On the positive side, that does make it faster to swap filters, which is often mentioned as a critical shortcoming for other lens systems. 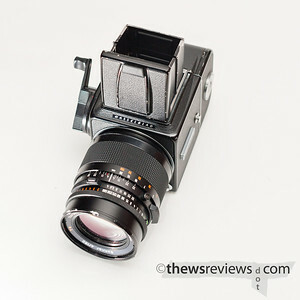 For those of us who don't own any Hasselblad-compatible filters, there are adapters that allow threaded filters and standard lens caps to be used instead. They're invariably a special-order item. And the reward for this is the nominal 6x6cm negative. The square format has proven to be timeless, as it's equally at home on record sleeves, CD covers, and social media avatars. For anything else, such as most things, there's always cropping. * This typically reduces the frame to about what the 645 format would capture, and those cameras accomplish three or four more frames to each roll of 120 film. Some of them even have metering. And autofocus. Of course, some people do brilliantly with square format cameras. Kirk Tuck comes to mind as a contemporary example, but I am not Kirk Tuck, and I doubt any of my readers are, either. By using many different formats over the years I have grown accustomed to composing on whatever viewfinder I see in front of me, so I'm not appreciably worse with a square format than I am with any other, but that's a state that's taken me years to attain. Without a doubt, Hasselblad "V-series" cameras and their accompanying Zeiss lenses produce technically outstanding images. I would expect no less from them – or any comparable system that costs close to what these do. I can't imagine that many Bronica or Mamiya negatives are being culled for poor image quality, even though they lack the Hasselblad's distinctive "V" notches at the edge of the frame. When combined with modern colour films, for the best possible quality, or traditional black-and-white, for the you-just-can't-do-this-with-a-cell-phone factor, these cameras still hold their own. The fact that you can put a digital sensor that costs as much as a car on these battlewagons means that the archaic all-mechanical camera still has a role in digital photography, and stands as a perverse testament to just how entrenched – and expensive – these cameras once were. I do like my Hasselblad. There's an essential thing-ness to it that really appeals to me, and the basic camera with the waist-level finder and no doohickery grippy winder add-on takes up remarkably little room in a camera bag. 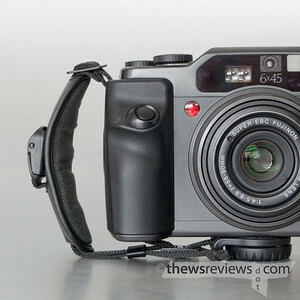 My 500c/m, with 80 and 150mm lenses, is a high-quality travel camera that's a good compromise when I don't need, or can't transport, my majestic Fujifilm GX680. 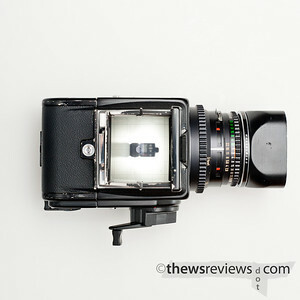 The viewfinder is big and bright, and mine even has a grid etched into it, which I adore. But for all of that, I have a very hard time thinking of any camera made during the past decades that's as temperamental and fussy as this old beast. If it wasn't a legend, would we tolerate it? Yeah, but: I'm not that easy to impress. The Long Version: Okay, I have to admit that I have a good reason to be biased. 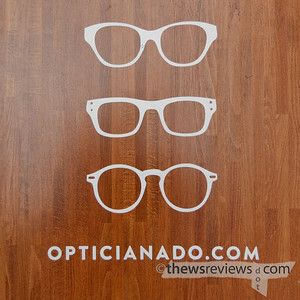 That doesn't change the fact that Opticianado, at 2919 Dundas West, is my new favourite place to buy glasses. 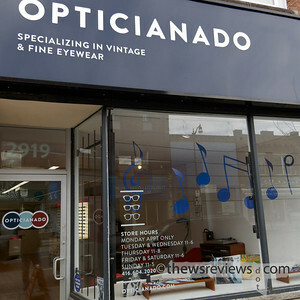 Opticianado's location puts it solidly in Toronto's west end, which is a slightly surreal place where the street numbers run backwards and Dundas is north of Bloor. It's in the Junction neighbourhood – my fellow east-enders can think of it as a more interesting version of Leslieville – where it fits in perfectly on a mixed commercial street with a refreshing lack of franchise stores. Sure, there is a Starbucks down the road for the people visiting the galleries and crafts stores, but we all need a balance. I've worn glasses for almost twenty-five years, so I've visited a few opticians in my time. 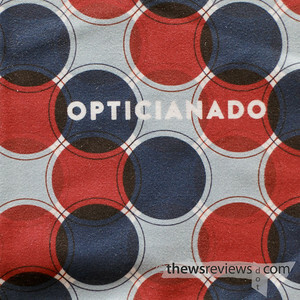 By selling a mix of new and vintage glasses, Opticianado has things that I've never seen before, along with some of my favourites. I was especially pleased to see that they sell Lindberg, which is what I had before my current set; these take lenses that are unusually hard to make, and make my current Oakley frames feel like cinder blocks. When the time comes to replace them, I know where I'll be going. It also doesn't hurt that it's a ridiculously good-looking store. But I didn't just stumble into Opticianado by accident as I visited a different part of the city. Penny had correctly answered a skill-testing question on Twitter, and won herself a new pair of sunglasses. And these were some serious glasses, too – quite a considerable prize. But… they just weren't quite right for her. Penny found a different pair that she preferred, and that was no problem at all. The service and attention that we received was amazing. Even though we were being given an exceptionally good deal, everyone was enthusiastic, interested, and helpful – all things that I didn't experience when I last spent half-a-thousand dollars on prescription glasses elsewhere. That's a mistake that I don't plan on repeating. Yeah, but: I really like their logo. The Long Version: The worst thing about the Speck Candyshell Grip is the name, and that's the last time I will ever type it in full. I must not be their target market, because that middle wordlike sequence of letters was almost enough to stop me from buying this thing. But careful inspection of the product photos showed that only the brand name appears on the case, so I went ahead with it. I picked the yellow, but it's also made in white, red, black, and blue. My first impression of the iPhone case – once the packaging with that word that I won't repeat was safely disposed of – is that it's attractive and very well made. My previous iPhone case experience is with the Sena and Twelve South leather cases, but I've used plastic, silicone, and hybrid cases for my old Blackberry. The Speck beats them all. It's a thin layer of polycarbonate, slightly flexible, that's bonded to the inner rubber and with the gripper panels (apparently) bonded to it in turn. What look like little bumpers on the corners of the case are actually expansion joints that let the case stretch to fit over the phone, giving a solid hold from its one-piece design. The rubber on the back of the case really does provide a solid grip, while the smooth plastic still makes it fairly pocketable. It's not the best of both worlds, since that's a situation that can never really exist, but it's a good compromise. There's also a pronounced ridge around the perimeter of the case that keeps the screen away from flat surfaces, and the case had no problem snugging over the screen protector that I have installed. The buttons are easily activated with rubber over-buttons, except for the ringer/vibrate toggle, which has a cutout that's sized for a finger, but too small for a thumb. The headphone cutout isn't overly generous. My usual pair of earbuds just sneaks in, although the case will happily accomodate my Sony 7506 monitors and two other pairs of earbuds – but not at the same time, of course. I measure the opening as 8mm across, so if your headphone jack is approaching that try the case before you buy it. Naturally, the cutout for the 30-pin connector is large enough to accommodate Apple's original cables, but anything that's designed to sit flat to the base of the phone, like a dock, is out of luck. One quirk of the Yellow case is that it's extremely difficult to accurately reproduce the colour. 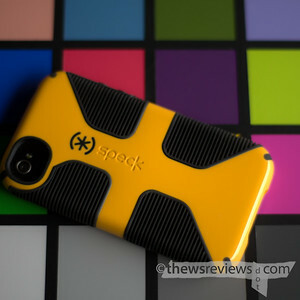 Speck's own website shows this case's colour – officially called "Butternut Squash / Black" – as two different interpretations of yellow. 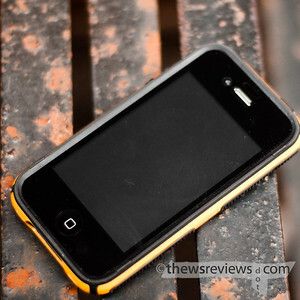 Most of the product shots that I've seen in other reviews lean toward 'canary', which isn't right. The case isn't the same colour as Sony's old 'sport' walkmans, with more orange in it than the usual outdoorsy-ruggedy electronics colour. The photo above shows it on a colour reference card, with neutral greys along the bottom, and it's pretty close to the real thing – but even colour-calibrated monitors will reproduce it slightly differently. 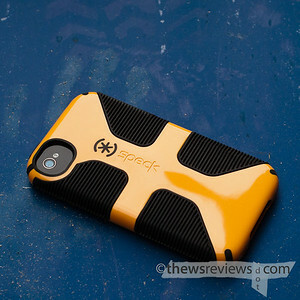 Marketed as a 'gaming' case, the Speck __________ Grip does a good job of turning the flat glass iPhone 4/4s into the rounded plastic iPhone 3G. But its corners are comfortable to hold, the grip panels work well, and it hasn't turned out to be the lint-magnet that I feared it could be. My only real "oh, well" moment with it was when I discovered that the slightly curved back means that the phone can wobble a bit when it's resting on a flat surface, making typing just slightly more awkward. But if I wanted great typing instead of good looks, I would have bought a Blackberry, right? Five-month update: After months of use I'm still a fan of this case, but it has some definite wear-and-tear. The soft rubber around the perimeter has worn down, including one spot where the hard plastic shell shows through, and the little nubs are gone. I've also dropped it a couple of times, which is probably why the hard plastic has broken around the headphone port, the dock connector, and the bottom speaker and microphone ports. These are all places where the plastic is thinnest, and since the case is actually held together by the bouncy rubber lining, it's not structural. Just the same, I've added another case to my lineup and expect to only use the Grip when its extra protection is likely to matter. Yeah, but: Who doesn't love carabiners? 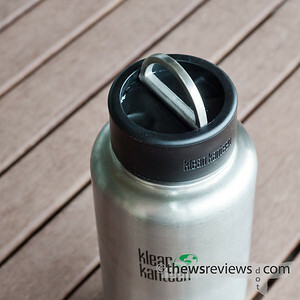 The Long Version: While my household has a growing collection of Kleen Kanteen bottles – seven and counting – the D-Ring Flip is the first extra cap I've bought. It fits their wide-mouth bottles, of which I own two, and it changes them to have a boxier profile. Like the other wide-mouth caps, the interior is steel, and the cap needs to be washed by hand. There's certainly no doubt about the construction quality of the cap, and it helpfully even has a couple of little depressions to make lifting the D-ring easier. The plastic rim stands taller than the metal ring, and the brand name is recessed into the sides to give it a little grip. Not much, but a little – more would be better. 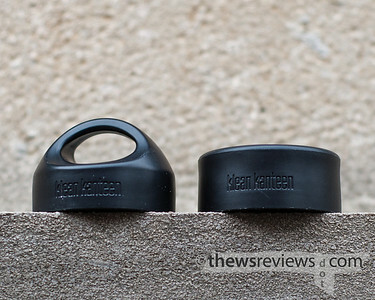 The advantage of the D-ring is that its narrow profile makes it easy to attach to a carabiner, something that the standard cap isn't the best for. The tradeoff is that it just isn't as comfortable or easy to open as the larger plastic design. When it comes to compactness, I'm not really sure that there's much gain. 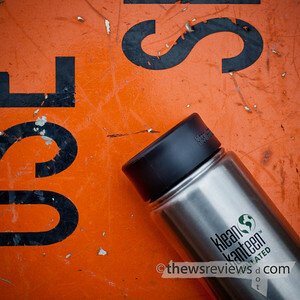 The folded-down D-ring cap is less than two centimetres shorter than the standard wide-mouth design, bringing the total height of my insulated bottle from 26cm to 24cm. That's not a huge space saving to justify the $8.95. I bought the D-ring cap without seeing it in person – it was an Amazon add-on to cross the free shipping threshold. If I had seen it in the stores I probably still would have bought it, as much for the novelty and variety as anything else. It does solve the problem of needing an easy `biner attachment point, but it's hardly a must-have accessory. Yeah, but: "'Not the same thing a bit!' said the Hatter." The Long Version: There's a lot of truly bad photographic advice out there, but I can't think of anything worse than these four simple words: Zoom With Your Feet. 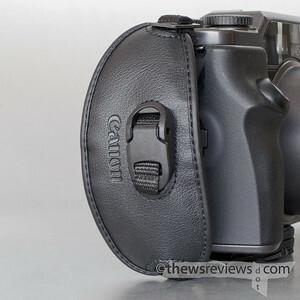 The idea behind it is that moving the camera forward or backwards is equivalent to changing the focal length of a lens. It looks like it's correct; a pair of sneakers can make the subject bigger or smaller in the viewfinder. But ZWYF is an insidious oversimplification: when you move the camera, everything else changes, too. "Zoom with your feet" fundamentally confuses perspective with proximity. The closer something is to the camera, the bigger it looks. But moving the camera forward doesn't just enlarge the subject, it enlarges it relative to the background as well. The camera's position sets the spatial relationships within the photo, and even small movements can create huge compositional changes. Keeping the same camera position and switching to a longer focal length doesn't change the subject's relationship to the camera or the background, it just makes it take up more of the frame. Focal length is a live-action cropping tool, a way of selecting and excluding, using the lens to create a new delineation of space. It's not just a matter of seeing farther away or squeezing more in: choosing the focal length literally defines the photograph. Whether wide or long, different focal lengths have unique ways of seeing the world because they crop differently sized rectangles out of it. Moving closer with a wide lens doesn't make its rectangle smaller, it makes the subject bigger in it; moving back with a long lens simply does the reverse. Subject-size and rectangle-size aren't the same things at all. 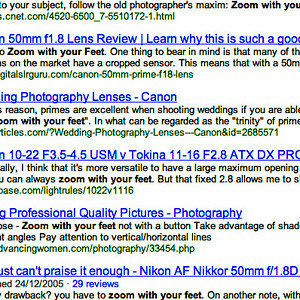 "Zoom with your feet" needs to be retired from the photographic lexicon. Every photo is a combination of the camera position and the lens's field of view, regardless of what style of lens is used. Primes and zoom lenses both have their advantages, but suggesting that changing camera position is similar to changing focal lengths does a disservice to them both.